Radical chemistry plays a pivotal role from bacteria to humans. 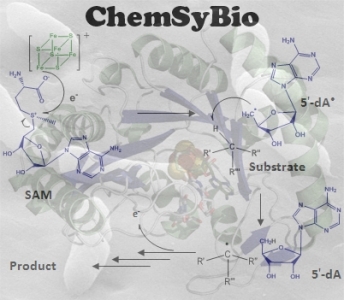 In recent years, a novel group of enzymes called "radical SAM enzymes" (rSAM enzymes) has emerged as the most versatile group of radical catalysts in living organisms. These metallo-enzymes catalyze chemically difficult reactions using a central radical-based mechanism. Although broadly distributed, the importance of these enzymes has been just recently recognized. They have been notably demonstrated to be involved in the biosynthetic pathways of many natural products (e.g. antibiotics, cofactors, enzyme active-sites) and also in major human pathologies (e.g. type 2 diabetes). Our laboratory has conducted pioneer studies in order to decipher the complex and often unprecedented mechanisms of these enzymes. By combining a broad range of approaches from biophysics to analytical chemistry and biochemistry, we discover novel reactions and post-translational modifications catalyzed by this emerging family of enzymes. Not only we are conducting mechanistic studies but we also investigate the involvement of rSAM enzymes in physiologically relevant processes such as bacteria-host interactions.